The entire run-up to the birth of the Jolie-Pitt twins has amused me from the get go. Or perhaps bemused is a better description. Hello people! Many women who are carrying twins are placed on bedrest in the last few weeks, if not the entire last trimester, to ensure that the mother rests and that those two little ones can stay in there for the longest time possible. It’s not unusual, it’s not really a big deal, and it certainly doesn’t deserve the sort of coverage it garnered. Then even better was the “She’s in the hospital and she’s cranky!” Please give me the name of someone who enjoys a hospital stay. Of course she’s cranky! It’s summer, her hormones are in full throttle, she’s about to have two babies at once, and she’s eating hospital food. I totally sympathize. It was even bigger news when Brad would visit her at the hospital. Yes, if I am carrying your children you are damn well going to visit me at the hospital. And you’d better bring snacks, too! Would you expect him to never see her? Then they would run the headline “Bad Dad Brad” or some such ridiculous thing. And the press seemed surprised that he would actually bring their other children to see their mother. Newsflash! Kids miss their mom when she’s not there! The best way to deal with that? Let them see her! You know Occam’s Razor and all that. But hey, that doesn’t make for very entertaining copy, does it? So, now we can breathe a sigh of relief that the whirlwind is over. That is, until Gwen Stefani goes into labor and then all hell is going to break loose. This entry was posted on Tuesday, July 15th, 2008 at 6:49 am by Glinda and is filed under Big Bad Business, Celebrity Dads, Celebrity Kids, Celebrity Moms, Infant. You can follow any responses to this entry through the RSS 2.0 feed. Both comments and pings are currently closed. I cannot bear to hear about celebrity baby news. The media acts like there is something new or interesting about something gazillions of ordinary families experience every day. Enough already! I still can’t believe how much money they got for pictures of their kids, imagine if they tried to sell the kids on e-bay! 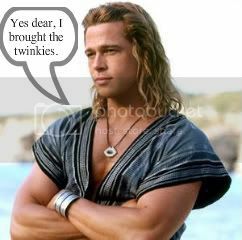 I just like having proof Brad Pitt’s sperm works. Someday I shall test this for myself! What surprises the Annalucia was that the young children were allowed in to see their mother. Here in Chicago, at least, the hospital rule was that no child under 10 could visit the baby sibling in the hospital. Perhaps La Jolie is in some hyper-exclusive private clinic where the ordinary rules are relaxed somewhat? And to the raincoaster: LOL! Annalucia, Brad brought the kidlings to see her while she was in the hospital on bedrest. I’m not sure what happened after, although I’m sure with the money she was paying, she could pretty much do whatever she wanted!